It is frequently said and generally true, especially well into the 1900s, that America is a land of immigrants, due to the huge numbers of people that have flocked to the United States since the early 1600s when the Pilgrims began the process, crossing the ocean in a long and perilous journey seeking religious freedom. A major wave of immigrants arrived here during the colonial era, during which the United States of America was born, and another wave occurred from 1880 to 1920, as thousands arrived seeking greater economic opportunity. While these periods saw immigrants voluntarily traveling to America, thousands of African slaves reached our shores, brought here against their will from the 17th century well into the 19th century. Four hundred years after the Pilgrims sought freedom of religion, America is still a favored destination for people from many other nations, and many or most of them come from highly troubled circumstances in their home countries and seek a better life, and as we have seen more recently, many sneak across the borders, and some come here to cause trouble and pain. Curiously today, we also find thousands of Americans voluntarily giving up their U.S. citizenship for that of other countries. This is a trend that has seen surprising growth over the last several years. 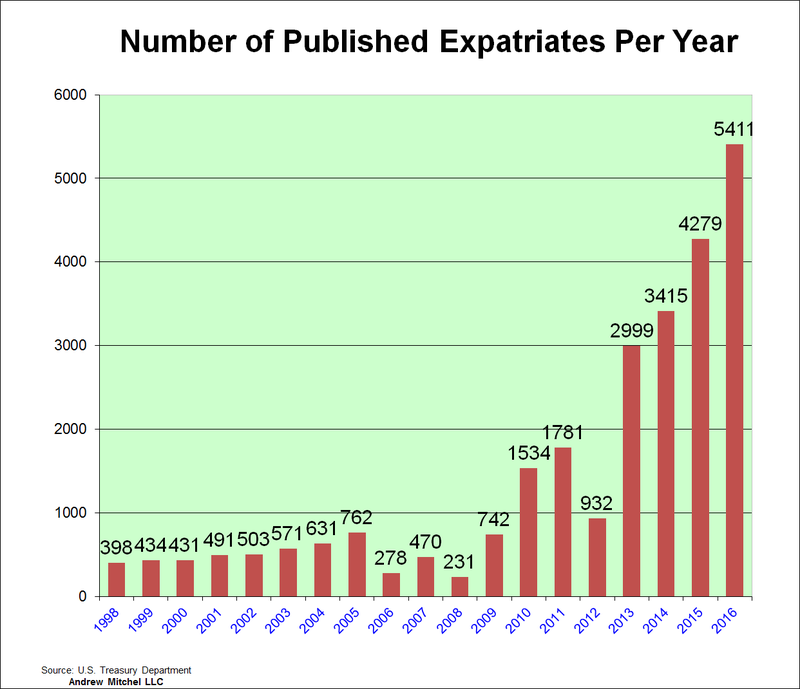 Looking back to 1998, 398 Americans gave up their citizenship, and through 2009 the number of American expats ranged from a low of 231 in 2008 to a high of 762 in 2005, which was the end of a slow but steady seven-year increase in expatriate activity, according to data from the U.S. Treasury Department. After that, the numbers bounced around below the 2005 high, but then in 2010 that number nearly doubled, with 1,534 Americans giving up citizenship. This was the start of a period of increasing numbers of expatriates for every year except one, until it peaked last year at 5,411. Interestingly, more than one-third of those expats in 2016 took this step in the last quarter of the year when the presidential campaign ended and the election was held. This raises the question of whether so many did so in the last three months of the year because they feared Hillary Clinton would win the election, or whether they decided to split after Donald Trump defeated her to become president? During the run-up to the election a long list of recognizable names threatened to leave the country if Trump won, including one Associate Justice of the Supreme Court, Ruth Bader Ginsberg. It is worth noting that Ginsberg and many, or perhaps all, of the others threatening to leave are still here. As these personalities were advertising what turned out to be their idle threats, countries like Canada and New Zealand advertised themselves as desirable destinations for Americans ready to abandon ship. As it turns out, New Zealand is the third most popular destination for American expatriates after Malta and Costa Rica, and followed by Mexico. Why are people who are citizens of perhaps the most sought-after destination for people leaving other countries willing to give up U.S. citizenship to live somewhere else? There are several reasons, such as that some of them fell in love with the culture and history of another country while on a trip abroad, and decided to move there. Or perhaps some may be immigrants who came here, became citizens, and want to return to their native land. The U.S. tax code once again rears its ugly head. Its irrational design not only encourages businesses to move to other countries, but encourages individuals with earnings in other countries to abandon their citizenship, as well. However, President Donald Trump has pledged to overhaul the tax code, reducing tax rates on businesses and individuals, among other changes, and that may make a difference for these people. Inside the tunnel where the Left lives, peering out on the world with their narrow view of things, everyone that makes a lot of money and every large company is an evil thing that threatens survival, so tax breaks that help the wealthy and the rich corporations are a bad thing. But moving past the liberals’ tunnel vision, removing tax provisions and regulations that punish businesses and creating an environment that invites businesses, will encourage those that left to return and will help domestic businesses to expand and produce the jobs the country so badly needs. Lowering personal tax rates and raising the standard deduction will leave more hard-earned income in the hands of regular people, who will then spend and/or invest it, both of which help the economy grow. And doing away with taxing foreign income will remove a factor encouraging people and their money to seek greener pastures elsewhere.